Martin and I set off early this time, and by 8 am we were already on the road, after having stopped to get some juice and pastries for breakfast. We rode out of the city and shortly after came to a big river crossing. I had read on the HUBB that there was no bridge and we would need to keep some rubles before crossing into Kazakhstan to pay for the ferry to cross it. It turned out that there was a bridge, it was one of these pontoon bridges floating on the river and we had to pay 50 rubles to cross it. The surface of the bridge was made of big planks of metal, bent and dented, so it was unbelievably slippery, but we made it to the other side without dropping the bike. From there, it was a short ride to the border, which was surprisingly easy to cross. There was a queue, but we just cut to the front and the guard let us through. 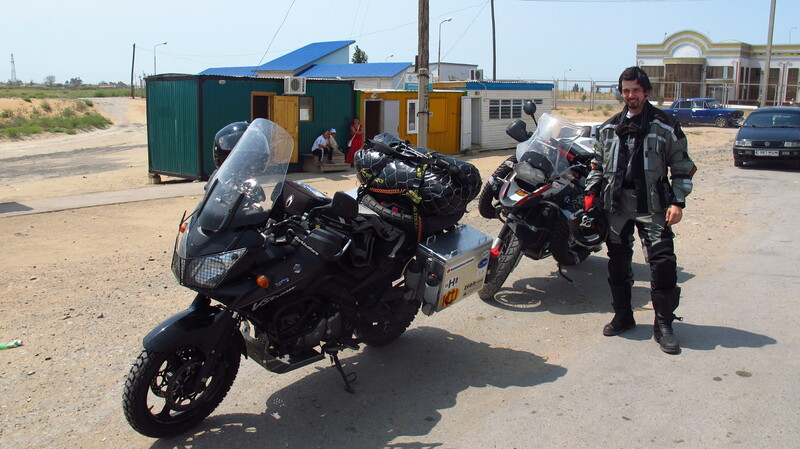 We cleared the Russian side without any problem, even though we had not registered with the authorities in the country, and we were not asked for the temporary import papers for the bikes that we had been given when we entered the country from Ukraine. On the Kazak side the borders were friendly and very curious about our trip, it was a shame that we could not take pictures. Using some hand sign language, they told me we could exchange money right there at the customs building, and just across the border there were lots of people also offering to exchange money and sell vehicle insurance. Since my European insurance only covered up until the European part of Russia, I got one which covered me for 20 days for about 27€. The road turned immediately nasty, with lots of potholes that made us ride on the footpegs and we had to be careful not to hit them, as they were deep and with rough edges. An hour or so into the country we stopped for petrol at a small village and from then on the road turned quite better, allowing us to travel at about 80km/h, but still being careful to avoid the occasional deep pothole. We were planning to make it to a town called Dossor, which was about 100km further than I had originally planned to go, but the day had been good and the road was not as bad as we had feared, so we thought we could make it. Shortly before Atyrau we stopped for petrol one last time, as that would be enough to get us there. 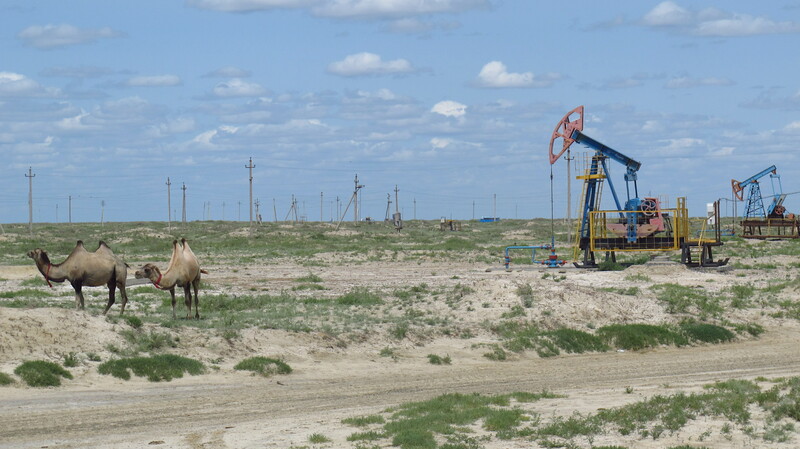 The landscape in Kazakhstan was quite boring, miles and miles of nothing, just desert, camels and horses and from time to time a village or oil wells. The road after Atyrau was surprisingly good, and we were able to ride fast all the way to Dossor. We stopped for one last time to buy some water and Martin also got a pair of sunglasses he could wear under his goggles, as it was very sunny. As we were getting ready to get back on the bikes, a Belgian guy on a weird bicycle pulled into the petrol station. 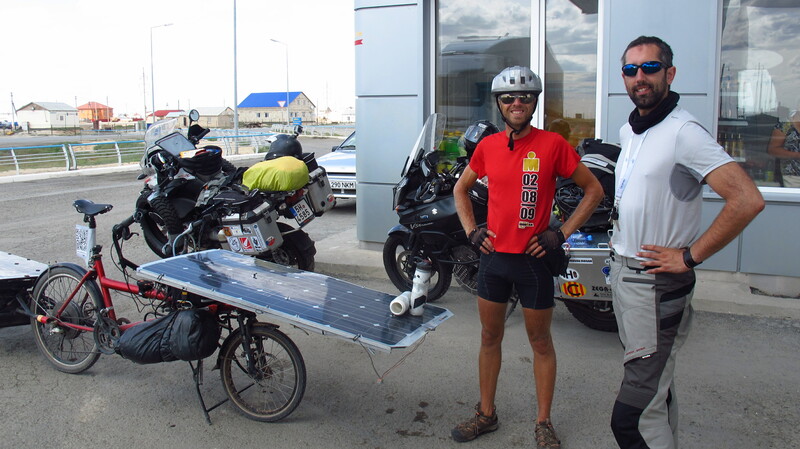 He was taking part on a race that were riding solar powered bikes from France to Astana, and at that moment he was the leader. He was into the solar energy business and had designed the bike himself, the told us two of his prototypes were taking part in the race. We wished him luck and warned him about the roads, but he seemed to be confident that the bad roads would not be a problem on his bike. 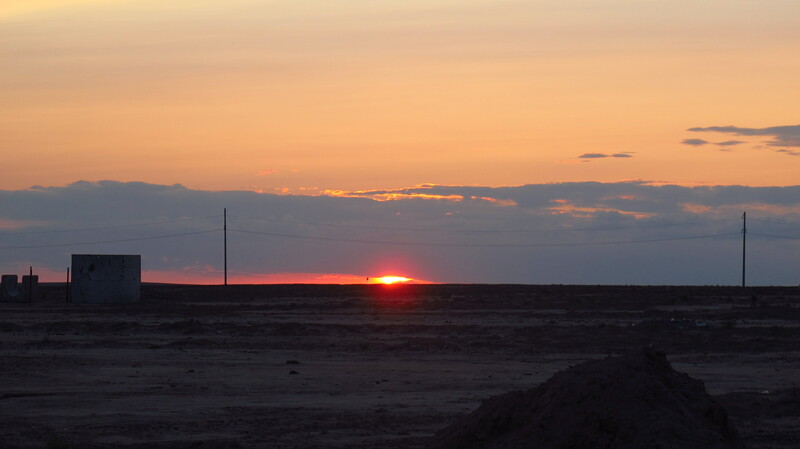 We got to Dossor at about 7 in the evening, and stopped for petrol at a station at the crossroads where we would part ways the following morning, Martin going south to Uzbekistan and me north to Aktobe. We asked the guy at the petrol station where we could camp, and he told us that it would be better to do it behind the building, saying that it would not be safe to camp further outside the town. Putting up the tents in the wind was quite difficult, and it was unbelievably dusty. In only half an hour the tents were full of desert dust on the inside, and our stuff covered in it. I cooked some risotto on my stove and sat down against the petrol station building to eat it watching the sun set on the desert. 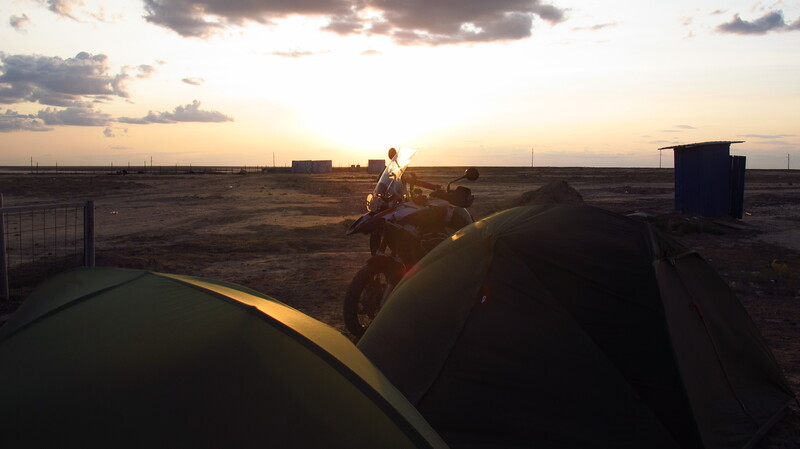 This entry was posted in Stroming The World 2013, Travel and tagged Border crossing, Dossor, Kazakhstan, The Sun Ride by Kilian. Bookmark the permalink.